How to tell an electric car from a gas one? The answer seems pretty obvious, and a Nissan Leaf, if not beautiful, certainly looks distinctive. But it’s more difficult with a Ford Focus. The average person will not take the time to look for cues, such as the absence of a tailpipe. There should be an easier way, just like there is in Norway. The Scandinavian country is leading the world when it comes to EV market share. 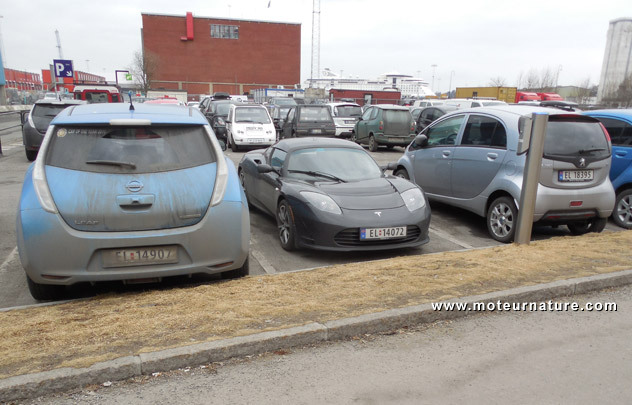 There are many advantages in driving an EV in Norway, and some of them required an easy way to set them apart on the road. The Norwegians have chosen to make EVs distinctive by making their license plate numbers start with EL (our picture shows an EV-only parking in Oslo). France has acknowledged it will do something similar. This year. We don’t know how yet, and more important, we don’t know what advantage EV drivers will get from their original registrations. But we shall find out later this year. Stay tuned.